SEF, Inc., now offers coil binding to our customers. Forms can be bound in books using coil binding. It is also used for any book that you want to be able to lie flat, such as cookbooks, instruction manuals, musical scores, daily journals etc.. Coil binding is composed of either metal or plastic coil that looks similar to a spring. (At SEF, Inc., we only do plastic coil binding) The coil is fed through specially punched holes and then is cut to size and crimped to keep the coil from backing out of the holes. When used for business forms there is usually a 150 lb Manila Tag cover with a chipboard backer. Covers may also be scored, as with the triad cover, to provide a division between the form sets for writing. 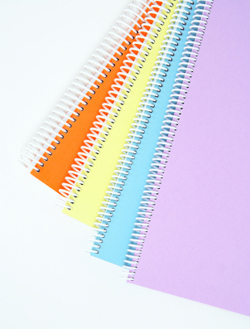 Coil binding provides a book that will lie open and flat and is useful for many applications. Three pieces of equipment are required for coil binding. A punch is used to create the holes along the edge of the document. Then a coil inserter is used to thread the coil through the holes in the cover. Some shops choose to do this step by hand. Finally the end of the coil is cut to size and then must be crimped to prevent the coil from coming loose from the book. This step can be done using crimping pliers that cut and crimp the coil simultaneously or by using a machine that has been designed for this specific purpose. PS: Coil binding is my favorite type of binding and I coil bind everything I can from notepads to books. I even cut the backs off of my reference guides and coil bind them. One of the great things about coil binding my note pads is the fact that it makes it easier to go back and review the information because the notepad stays intact. This has saved me a time or two when I wrote down a password and entered it wrong in my password database software.